Good health care can be expensive nowadays but most of our clients still want to provide their pets with all the benefits of modern medicine and diagnostics. For several years we’ve been talking about creating a system to allow our clients to spread their pet care costs out during the year, and we are finally taking the plunge and making it happen. You can now purchase a health care package at Best Friends that will give you twelve months to pay for a pet’s exams, vaccinations and laboratory testing. A basic package for a healthy adult dog or cat costs as little as $25 per month, depending on what vaccinations your pet needs and what breed of dog you have. Extra diagnostic testing for diseases specific to your dog or cat’s breed and age are included. Every pet has different health care needs. Some cats go outdoors and require extra vaccinations. Some dogs have exposure to deer ticks, which carry Lyme disease, and some don’t. Some breeds of dogs have tendencies toward specific diseases that we can test for and monitor. There is too much variability to set up just a few basic plans. What we decided to do is to total the wellness services a pet will need during a twelve month period and divide that by 12. Simple and flexible! 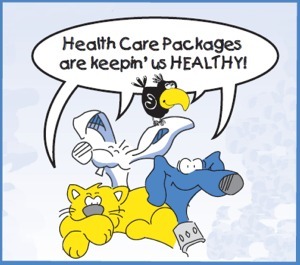 While your pet is on a health care package there will be no charge for office visits. If your dog has an ear infection or your cat becomes ill you will pay for an examination and any services or treatments needed but you will save the $26 office visit fee each time. You’ll also receive a wallet ID card with your pet’s picture on it and special offers throughout the year. Packages do not include diets, medication or preventative products. As always, these items are paid for when purchased. Services included in a package can be performed at any time during the year and a package can be started at any time. Your payments would remain the same each month for twelve months.